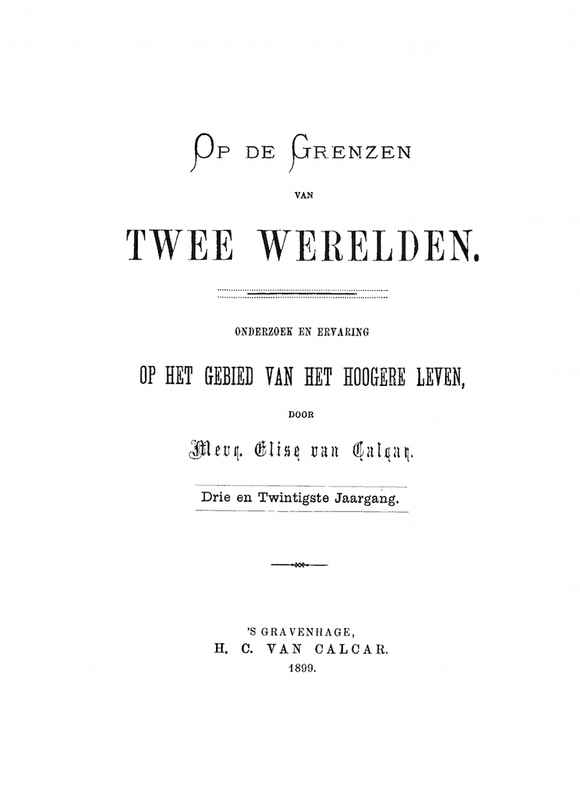 In 1877 Dutch feminist, writer, pedagogue and and perhaps Holland's most famous spiritualist Elise van Calcar (1822 - 1904) founded her magazine Op De Grenzen Van Twee Werelden (On The Borders Of Two Worlds). When the last issue of the magazine was published in 1905, she had written and translated about 11,000 pages in a series that would number 29 annual volumes. Van Calcar promoted a brand of Christian spiritualism, as opposed to eastern spiritualism, read: Theosophy, with which she would have nothing to do. She was also opposed to Allan Kardec and was vehemently against the followers of the doctrine of reincarnation. She wrote in her travel diary in 1879 that the followers of reincarnation had no idea of the life in the unseen, immaterial world and of a life with The Lord, who even create a barbaric language for their fateful idea, calling being born 'reincarnation' and dying 'desincarnation' and who use the word 'reincarnation' to disavow the Biblical concept of rebirth as spiritual renewal. In 1847 Elise van Calcar became very interested in Kerner's Die Seherin von Prevost. Her husband, Herman Carel van Calcar, a former mayor of the Dutch town of Wassenaar, was a magnetizer who also worked with mediums. Seances were often held in her house. She corresponded with Baron du Potet whom she greatly admired, and Louis-Alphonse Cahanet, who in 1882 appointed Elise van Calcar honorary member of the Societe Magnetique de Geneve. Calcar visited Paris for a second time in 1878, staying with Mme Emile de Morsier, a spiritualist feminist who often was to be found in the salons of Christian theosophist and Blavatsky admirer Lady Caithness. Owing to De Morsier's connections, Elise van Calcar would also meet Victor Hugo. In 1883 Elise van Calcar founded the Spiritualistische Vereniging voor Onderzoek en Ervaring (Spiritualist Society for Research and Experience), which was also the subtitle for her magazine. Elise van Calcar lived to become 81 years of age, although she was often ill, sometimes her illnesses were of such serious nature that she thought she would die. In all cases she took to alternative medical therapies. From 1885 till her death, Elise van Calcar used one medium, Johanna van Kempen. Elise van Calcar would die in 1904 due to a stroke. Her husband would die a year later. Their marriage remained childless. Sources: Marga Greuter, Op De Grenzen Van Twee Werelden: Onderzoek En Ervaring Op het Gebied Van Het Hogere Leven, MA Thesis, n.d.
Douwe Draaisma, 'Een Lichtstraal Over De Graven, Elise van Calcar en het Spiritisme', Jaarboek voor Vrouwengeschiedenis 14, 1994. 'De Schrijfster Elise van Calcar', in: Marcel Poorthuis, Theo Salemink, Lotus In De Lage Landen, 2009, pages 41-50. Op de Grenzen van twee Werelden. Onderzoek en ervaring op het gebied van het hogere leven. The Hague, Netherlands. Language: Dutch. 1/1, 1877-1904, 28 volumes. Calcar (1822-1904) was a whirlwind of energy in the nineteenth century manner. She was born illegitimate and sickly and early in her life turned to universal reform, especially education (the Froebel method) and women's rights and advancement, and to writing, producing a stream of novels (romantic, reform, and, later, spiritualist), pamphlets, children's stories, and this journal. In her youth she read widely on Neoplatonism, classical magic, Justinus Kerner, Swedenborg, Mesmerism, and the like, all of which colored the content of her journal after she formally took up spiritualism. The journal was published by her and her husband and contained, besides the standard accounts of seance revelations, discussions of "miracles," physical phenomena, asceticism as a prerequisite of mediumship, clairvoyance, hallucinations, hypnosis, Swedenborg, David Duguid, magic, Adelma von Vay, William Stainton Moses, and the like. She early on defended H.P. Blavatsky's Theosophy and Isis Unveiled in Revue Spirite but later rejected Theosophy because of its belief in reincarnation, which she rejected. She wrote regularly in the journal on Emma Hardinge Britten, translating and publishing Wilkinson's edition of EHB's Autobiography (1900) in the journal, publishing a translation of a section of Ghost Land. The journal served for Dutch-speakers as an introduction to and overview of European, English and American spiritualism. On van Calcar, see notice in the Biografisch Woordenboek van het Socialisme en de Arbeidersbeweging in Nederland, online at http://www.iisg.nl/bwsa/bios/fleischacker.html. Microfilm (European Women’s Periodicals); Erasmus University Rotterdam; Koninklijke Bibliotheek, Den Haag.